WHAT IS A HAND REJUVENATION PROCEDURE? 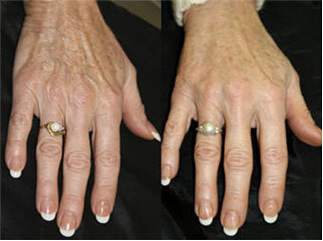 The hand rejuvenation procedure helps restore the hands to a more youthful appearance. Volume enhancing fillers are injected into the dermis (middle layer of the skin) to moisturise your own skin from within. Fillers help improve skin texture and tone while chemical peels can help to improve pigmentation problems caused by sun damage. WHAT ARE THE DIFFERENT TYPES OF HAND REJUVENATION TREATMENTS? There are various types of hand rejuvenation treatments you can opt for. All of these options possess their own set of risks, benefits, costs, and techniques. Chemical Peel: If your hands are affected by age spots or liver spots, a chemical is applied to the skin, where it causes the age spots to disappear while tissue appears less transparent. Volume enhancing fillers (Radiesse®): When these fillers are injected into the hands they can plump up the skin and give it a more youthful appearance. It is a simple procedure and is performed under topical anesthesia in Dr Anushka’s office. Injection pain is minimised by use of a topical cream before the procedure. Following the procedure, you may immediately return to daily activities, however, treated areas may be swollen for 1-2 days. There is also potential for bruising around the treated area, which may be covered with a concealer. Depending on the areas treated, most of the correction may last for months, or even years. Dr. Anushka’s patients usually see results that last between 1 to 2 years. Touch up treatments may be necessary to maintain the desired outcomes. The Radiesse® Injectable Fillers cost from R8000 per filler. The final price will depend on how many syringes are used. If you are considering a hand rejuvenation treatment, and would like to know which of these procedures would work best for you, please consult with Dr. Anushka.